Psychoanalysis has always been a source of controversy throughout academic and popular culture. This controversy relates to questions of its true value, its scientific status, its politics and its therapeutic effectiveness. Psychoanalysis' defenders regard it as a body of knowledge built on careful and painstaking exploration of complex clinical encounters, offering more detailed and valid insights than can be obtained from other sources. Psychoanalysis is also a building block for considerations of human subjectivity in a wide range of academic disciplines and practical areas of work, from social theory to feminist studies, to counselling and psychotherapy. 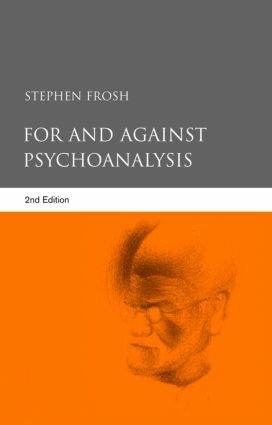 In this thoroughly revised and updated second edition of For and Against Psychoanalysis, Stephen Frosh examines the arguments surrounding psychoanalysis at some key points: its standing as a scientific theory, its value as a method of therapy, its potency as a contributor to debates around identity construction, gender, homosexuality and racism. At each of these points, there is something to be said 'for and against' psychoanalysis, with the balance depending on whether it deepens our understanding of human functioning, whether it is consistent with its own perceptions and theories or seems subservient to social pressures and norms, and whether it is coherent or muddled, evocative or sterile. For and Against Psychoanalysis provides an accessible introduction and critical guide to the current standing of psychoanalysis. It is essential reading for students of psychoanalysis, counselling, psychotherapy and psychology, and for social researchers and social theorists, as well as for those who are simply interested in what place psychoanalysis has in the modern world. Psychoanalytic psychotherapy – does talking make things worse?